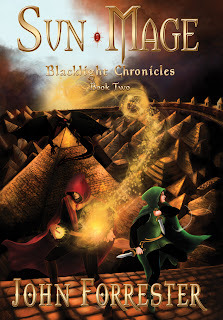 Introducing the second book in the Blacklight Chronicles, SUN MAGE! The book is available right now on Amazon Kindle. After over three years of writing and too many revisions to count, my second novel is complete. "Sun Mage... was AWESOME! The fast pace for this book, like the first one, makes it a great read for pre-teens, teens and adults... I literally could not put Sun Mage down... I give this book 5 Ravens and now I am DYING to read the next one. I anxiously await its arrival." Far out to sea, a mysterious island holds the ancient city of Darkov. The immortal sorcerer Aurellia awaits the arrival of Talis and Mara. The Temple of the Sun lures both dark and light forces to discover its power. Talis and Mara will have to use their wits to escape slavery and trek out into the jungle. Foul fields of undead will trap them. Twin ancient cities, one of light and one of darkness, one ruined and one hideous in its power. Only one map can guide them. But can they bear to enter the land of the dead? To face the God of the Underworld himself? If they fail, their family and city will fall to the Jiserians. And the world itself will slip into darkness. Unless Talis can first unlock the power of light magic.